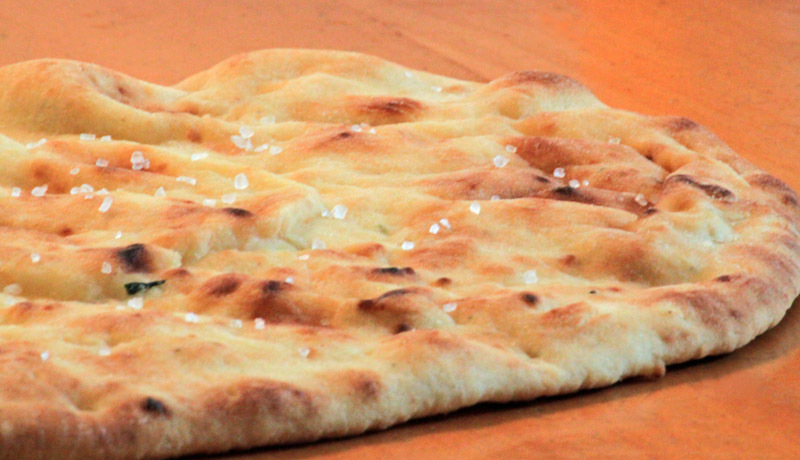 Making flatbread is easy! And there's no better way of taking control of the ingredients, than by making it yourself. Not only is it easy to make, but it also makes an excellent crust for pizza, and it's delicious on its own! In a large bowl, combine the yeast, water, and agave and let rest for 10 minutes. Stir in 3 cups of the flour and the salt, adding the remaining cup of flour a few tablespoons at a time, just until you have a sticky dough. Transfer it onto a floured board and knead until the dough is smooth. Divide the dough into six equal portions. Flour your hands to keep them from sticking to the dough, then press and pull the dough into the shape of an oval that is about 5 inches wide and 7 inches long. Dust each piece lightly with flour, then stack each one on a plate, separating them with a sheet of lightly oiled parchment paper. Wrap the stack in foil and refrigerate for approximately 2 hours. When the 2 hours have passed, preheat the oven to 400°F, then remove the dough and brush both sides lightly with olive oil. Sprinkle one side of each with thyme or rosemary, then press it in with your fingers to create small indentations, then sprinkle with sea salt. Arrange both flatbreads on a lightly oiled baking sheet and bake for approximately 7 to 10 minutes or until the bottoms are golden. Turn and continue cooking for another 3 to 4 minutes. The dough will keep for up to 3 days in the refrigerator. Just store in a lightly oiled bowl and cover tightly with plastic wrap.